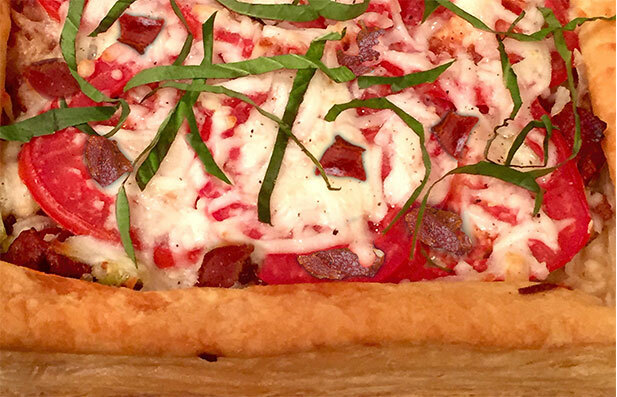 Perfect for a brunch buffet or a Spring lunch, alongside a green salad, this bacon and tomato tart is full of wonderful flavor. Roll the puff pastry sheet into a 12-inch rectangle on a lightly floured surface. Cut 4 (8 x 1-inch) strips from the pastry and place the strips along the outer edges of the pastry rectangle. Place the rectangle on a small baking sheet and place the strips on all four sides, to form a border. Poke the middle of the puff pastry with a fork. Bake at 400º for 10 to 15 minutes or until lightly browned. In a large sauté pan, heat the olive oil over medium heat. Add the bacon and cook, stirring often, until crisp. Remove the bacon with a slotted spoon and drain on a paper towel. Discard all but 2 tablespoons of the bacon grease in the pan and add the leeks. Sauté over medium heat for 10 minutes, stirring often, or until the leeks are tender and caramelized. Add the cooked bacon back to the pan and stir to combine. Top the baked puff pastry with the bacon/leek mixture. Sprinkle the tart with the mozzarella cheese. Top with the tomato slices in a single layer. Season the tomatoes with salt and pepper. Bake at 400º for 10 minutes more or until the cheese is melted.